Linking the port of Marina Grande with Anacapri and, for many centuries, the only way to reach the town built on the high slopes of Monte Solaro, the 921 Phoenician Steps are now a major tourist attraction. For thousands of years the steps were used by anyone who needed to transport goods from Marina Grande up to Anacapri. Much of the hard work was done by island's womenfolk, who regularly climbed up and down the steps balancing heavy vases on their heads. When, in the late 18th century international travelers started to visit Anacapri, donkeys were used to carry their trunks up the massive stone stair. The carriageway between Capri and Anacapri was only built in 1874. Incredibly late, especially if you consider that the only water in Anacapri was the rain water stored in cisterns, and so, until the road was built, the inhabitants of the town had to collect their drinking water from the Truglio spring in Marina Grande - and use the Phoenician Steps to get it and to bring it back home! The Phoenician Steps are well conserved (they were completely restored in 1998). This said, we suggest you walk up rather than down them: the stairs are steep and the risers high, making the ascent much safer -and less stressful on your knees! Where do the Phoenician steps start? The Phoenician Steps begin in Marina Grande, close to Palazzo a Mare. From the port, walk along Via Palazzo a Mare and, after about 400 meters, you'll see a majolica sign indicating the steps to your right. Whilst the first steps are child's play, they are quickly replaced by ever steeper blocks of stone. Luckily climbers' efforts are soon rewarded by some of the most amazing views on the island and the sight of the tiny chapel dedicated to Sant'Antonio of Padua, the Patron Saint of Anacapri. The chapel is not the only thing you'll come across on your way up. Look carefully and you'll see any number of little crosses carved into the steps. The Bishops of Capri had the crosses chiseled into the stone so as to ask for divine protection from the showers of rock which frequently fell on the islanders as they climbed up and down the steps. Starting to have second thoughts about making the climb? Don't worry! Scrupulously maintained steel netting now protects walkers from eventual loose rocks- whatever their religion. 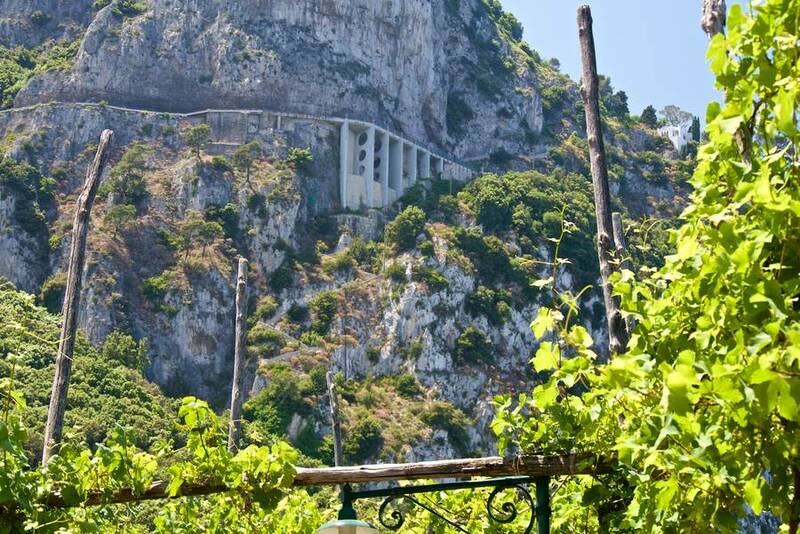 From the top of the steps, on flat ground once more, you'll quickly reach the Chapel of San Michele and the ancient archway which once marked the border between the towns of Capri and Anacapri. How long does it take to climb the Phoenician steps? Once you reach the top of the steps and the town of Anacapri, be sure to visit Villa San Michele:although the villa was built 20 years or so after the completion of the carriageway between Capri and Anacapri, as recorded in the book "The History of San Michele", great part of the building material needed to construct it was transported by man and donkey power up the Phoenician Steps. Those who have read Axel Munthe's fascinating book will no doubt remember the description of Maria, Anacapri's illiterate post lady, who climbed down (and up!) the 921 steps each day to collect letters and parcels for the inhabitants of the town from Marina Grande.